I’m calling this series of posts “The Runner’s Catch-22” to address a very common problem in the running world. A lot of beginner runners—let’s face it—want to run long. Very long. But in attempting to do that, they get ill, injured, or overtrained. And their hopes of running long (and doing so consistently) get quashed. Running isn’t just about running (as every injured runner knows). It’s about how to run well. But in all sports—in fact, in all movement—there’s a minimum power requirement that must be met: if you want to stand (correctly), your legs, along with your core and spine, have to be able to move into a standing position and be strong enough to support you. If you want to walk (well), your leg joints have to be able to flex and extend to a certain degree, and one leg has to be able to support more than your bodyweight while the other travels through the air. And if you want to run (properly) you have to be able to meet an even more demanding set of requirements. And this is where the story of the “Runner’s Catch-22” really begins. A lot of things have to be working well for a runner to be powerful—form and movement are vital, for example. Having proper form feeds into your ability to produce power (in the same way that it would work for a weightlifter or a baseball player). So with poor form, you might never be able to meet the power requirement—or go significantly beyond it. So, what is this power requirement? The body must be able to produce a habitual cadence in the ballpark of 180 steps per minute (spm). The body is most efficient at around 180 spm: this is the cadence that best engages the tendons’ elastic component, maximizing the amount of energy that can be taken from the previous step put into the next one. (This is a concept also known as energy return). UPDATE: For people who are new to running (particularly those who only started being active as adults), meeting that power requirement usually requires a lot of power training, which is a problem for beginners. Experienced runners often are able to produce a cadence of 180 spm easily and habitually, for runs of any distance. (In fact, hitting 180 easily is how I would define “experienced.”) If that’s you, most of this post won’t apply to you. Power training uses and develops the body’s anaerobic system, which is very powerful, but also produces negative by-products that, in large quantities, are ruinous to the body’s tissues. The anaerobic system is counterbalanced by the aerobic system, which disposes of those harmful by-products and allows the body to remain in activity for long periods of time. So if you want to be able to train without trashing your body, you need a powerful aerobic system to support the anaerobic system. Just one little problem: while the anaerobic (powerful but dirty) system grows extremely quickly, the aerobic (less powerful but clean) system grows veeery sloooowly. This is the runner’s Catch-22: Until you have a well-trained aerobic system, it is almost impossible to safely do large amounts of anaerobic training. Trying usually means burnout, illness, injury, or overtraining. But if you can’t do a lot of anaerobic training, you can’t develop power to the point that you can produce an efficient cadence (of 180 spm) at the kinds of low intensities where you can develop the aerobic system. It’s important to realize that the other option—running at an inefficient cadence while the aerobic system develops—is NOT a neutral, “eh, screw it,” kind of option. It’s not very bad—the aerobic system will probably still develop in time—but it’s not the fastest way to train, and certainly not the best way to guarantee you’ll achieve your goal. Learning a movement pattern the wrong-slash-less powerful way—yes, they really are the same thing—is the best (and probably least-discussed) way to prevent you from performing at a high level. If you learn how to throw a ball by releasing it far forward of your body instead of at ear level, you’ll very quickly plateau in terms of how much force you are able to put into it (meaning that you’ll never throw at 60 mph, let alone 90). Your body develops through movement. If you don’t move, you don’t use your muscles, which means that your metabolism doesn’t develop. If you can’t throw a ball faster than 60 mph (because of poor mechanics), your muscles won’t be able to grow in strength beyond what it takes to throw the ball at 60 mph. So your metabolism (aerobic or anaerobic) will never need to grow beyond that. It’s impossible for your metabolism to grow to be able to produce an energy expenditure that you don’t have the biomechanic possibilities to harness. Slow or low-cadence running isn’t a death sentence. Slow runners with relatively few biomechanical problems or muscle imbalances do increase their cadence and low-level strength by slow running . . . in time. So it’s often the case that people do end up running much faster and at a much higher cadence after a few months (or years) of slow running. But your power (and your cadence) won’t improve with slow running as fast as it could with actual power and cadence training. How to get around the Catch-22? Below is the short answer. (The long answer will take a few posts). An overwhelming amount of aerobic training (in sports where you can meet the power requirement). A small amount of running-specific power training (mostly plyometrics). A small amount of running at a cadence in the ballpark of 180 spm. Monitor metrics including HRV (heart rate variability) and MAF (Maximum Aerobic Function) Test to determine your short- and long-term physiological readiness for power training. All gait is a contralateral movement. Although It seems like the most obvious statement (perhaps to the point of being boring), it often astonishes me just how unexamined it remains. Discussing both the theoretical and practical implications—what it means for our training—is what this series of posts is all about. To say that a movement is contralateral is to say that when something happens in one side, the opposite will happen in the other side. During gait, if our left leg moves forward, our right leg moves back. But our gait is also reciprocal, meaning that the limbs in the same side move in opposition to each other, to balance their movement. If our right leg, supporting our body during the stance phase of gait, moves back, our right arm swings forward in a passive motion meant to balance out this movement. In the image you can see two pistons, each moving in opposition to each other around a crankshaft. This movement is—or should be—a lot like the movement of the legs around the hips. By the way, this imagery isn’t just a metaphor: there are important similarities between the mechanics of the piston system and the mechanics of the hips and legs. I liken the lowest point in the piston’s rotation to when the leg (the right) is in swing (1). The apex of the piston’s upswing corresponds to midstance, where one leg (the right) is fully supporting the body (2). At the same moment, an opposing piston must be in the lowest point of its downswing in order to balance the mechanism. Any problems in the balance of the pistons or the crankshaft can cause something to go horribly wrong. The same goes for the body, in order for its movement to be in balance. As the left leg clears the ground behind the body, the right (opposite) arm must be ready to initiate the upswing. And the right leg should be ready to start reaching for the ground below. Insofar this is the case, the movement can be said to be contralateral. Let’s look at the pictures of Mo again (taken as he is sprinting down the final stretch of his gold-medal performance in the 10,000 meter event of the 2012 Olympics). As you can see from the right arm in (1) and the left arm in (2), both pictures are taken at the same moment in gait (from the frame of reference of the arms). By comparing both pictures you can see a bit more flexion in early stance for the left leg (1), than for the right leg (2). At this moment in gait, the right leg trails further behind the body (1) than the left leg. (The left calf (1) is also at a larger angle than the right (2).) Without getting too far into the mechanical details, it would seem that Mo’s having a little bit more trouble stepping forward with the right leg than with the left. In effect, in picture (1) his left leg is flexed because it’s waiting for the trailing right leg to catch up. And if you look at the orientation of his forearms, you can see that the right elbow (1) is far more flexed than the left (2), mimicking, to almost a perfect degree, the angle of the opposite knee in each of the pictures. The point is that it wouldn’t matter where you look at the piston system (of an internal combustion engine) from. Whether you observe the piston system from the frame of reference of the piston head, the main axis of the crankshaft, or the counterweights, you would see that the entire system is balanced. Each counterweight remains perfectly opposite to a piston, and the pistons remain perfectly opposite to each other. This is so important that much of what makes sports cars—particularly “traditional” sports cars like Ferraris—and race cars cost as much as they do is the technology to keep the engine block balanced to the picogram. The better this is accomplished, the more torque can go through the engine without breaking apart the block. Mo Farah is not some amateur. For the past few years, he has set the highwater mark for excellence in distance running up to the 10,000 meters. And even then there are differences. Why is this happening? The “big” answer to this question probably isn’t in some esoteric discussion of biomechanics. Quite simply, the 10,000 meters are run on an oval track, and this is the final stretch. For more than 24 laps, he’s been turning into his left leg. It’s probably a lot more tired than his right, so it’s having a harder time supporting his body during stance. (Hence the flexion). If we asked Mo to keep running for a few more laps (not that he would) we’d find that his right leg would continue to trail a little more, and his left leg would flex even further. If you look at the video you’ll see that even down the final stretch he’s compensating quite well by driving forward with his right shoulder every step. But as he becomes more tired, we’d see that this strategic compensation stops being enough. We’d probably observe his left foot taking increasingly longer to leave the pronation (flattening) that occurs during the stance phase. The supination (pointing) which occurs towards the end of the stance phase, would come too little, too late, possibly creating a heel whip for the duration of the race. As this is happening, the huge amount of forces that go into his body as his feet strike the ground will travel through it at increasingly odd angles. There is a potent compounding effect here: The more experienced, fitter, and more rested body aligns itself correctly with the forces of running. The less experienced, less fit, and tired body does not. For the weekend warrior with the New Year’s resolution, running a marathon is biomechanically a far more hostile experience than it is for the skillful runner. Some people overpronate from the get-go. Others start with a tight hip. Over the course of 40,000 paces, this brings nothing but disaster. 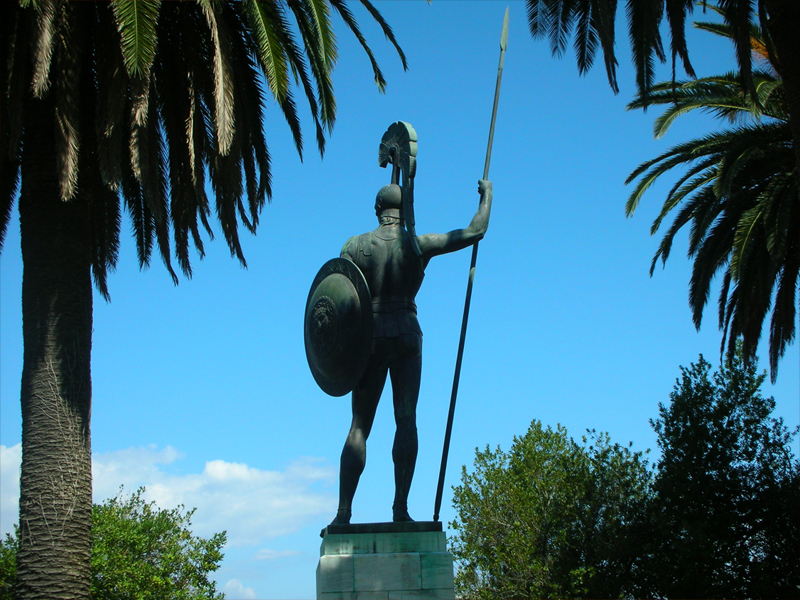 Physics favors the trained runner much like the Greek Gods favored the heroes of mythology, by further increasing their already formidable advantages in battle. The skillful runner already comes into the race with stronger muscles, denser bones, a more resilient nervous system, and a more robust metabolism. As a final reward for their training efforts, the impact forces of running fall into place and work with them, not against. Is “being slow” a protective measure for runners with bad form? We runners—and the scientists that study running—cannot seem to get away from talking about form. Across all sports, we have discussions about “good” or “bad” form. In running we don’t: we argue that all runners are different—that somehow, in running we are all unique. In principle, I think this is a little odd: when we’re trained correctly we all swim alike, golf alike, punch alike, but not run alike? Maybe there is no right way. Maybe there is. In recent posts I’ve made the argument that, for all sports, “good form” means “the musculoskeletal configuration that can produce the greatest power output.” I believe that we should adopt the same standard for running. I believe that if we don’t, we are depriving people of the guidance they need to achieve their athletic potential. There are several reasons for this. As I discussed in earlier posts, the first and most important reason is because across sports (whether they be power or endurance sports), the winner is the one who can generate the most power—technically, who can produce the most work (or energy) in the shortest amount of time. This is obvious in track and field sports, but it holds even for the ultramarathon: the best ultramarathoner is ultimately the one who converted more energy into forward motion in the shortest amount of time. But there are deeper reasons: For example, a reduction in power output—running slower, that is—can be a protective measure. The brain has excellent muscular inhibition capabilities. In a well-known lecture, Gray Cook eloquently describes how, when certain shoulder problems exist, the brain reduces the body’s grip strength if and only if the hand rises above the shoulder. When the brain detects that there’s a problem, it inhibits muscular activation that would allow for a behavior that could result in damage: gripping something heavy above the shoulder level is dangerous with an unstable shoulder, and so the brain disallows it. Running, an activity in which the body incurs an astounding amount of shock and load, should follow the same pattern: if there is an important mechanical or neuromuscular pathology, the brain will limit the energy available to power the running gait. 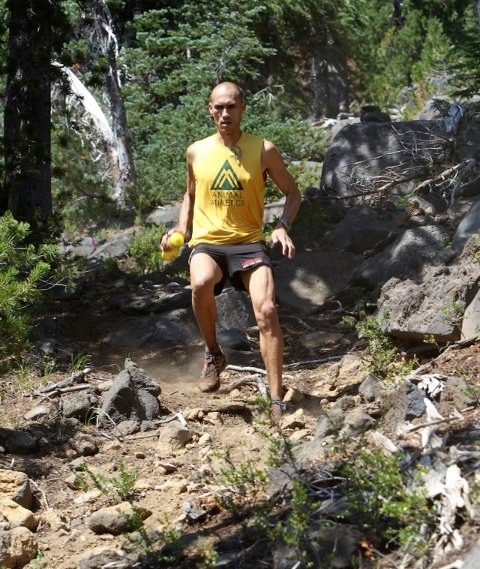 Yassine Diboun, one of the heroes representing the US in the 2015 IAU Trail Championships. (This is NOT a slow runner). Suppose that someone toes the starting line on a marathon (or a 5k, for that matter) with unstable hips, dumb glutes or abdominal muscles that don’t know how to stabilize the spine in relation to a pelvis (and lower extremities) that are going to be contralaterally loaded with up to three bodyweights per stride. In that situation, it is completely reasonable for the brain to execute a similar calculation to the one that Cook describes in the abovementioned video. However, instead of reducing the power output available to the hand and forearm muscles, the brain inhibits muscles related to gait (whether they be the weak muscles themselves or other muscles up or down the kinetic chain). But lets think of the implications of this: How many runners are protecting themselves from injury by being slow? Let’s put this question in a more compelling format: how many runners with a high risk for injury are remaining untreated (meaning that their athletic development is being compromised) because they have been conveniently categorized as “slow runners”? We shouldn’t just say that the correct running form is what “feels right”: suppose that a golfer has poor sensation in their external and internal obliques. Would the proper golf swing “feel right” for them? Absolutely not! That golfer must go to a health specialist to integrate those muscles functionally into the rest of the body. Then, that musculature must be trained to produce the golfing swing that can generate the most power. Similarly, establishing the “correct” running form as the one that allows people to produce a greater power output allows us to guide people towards greater athletic performance. But there’s more: remember that inhibitory reductions in power output are a protective measure. This means that the process of “running the right way” will center around eliminating neurological, muscular, and skeletal imbalances and their resulting gait pathologies. That way, all protective reductions in athletic output will be minimized. More people will be fast, and they’ll be fast because they’re less likely to be injured. What is the role of efficiency in athletic performance? In various social media, the following observation was made several times about my last post: efficiency plays an important role in athletic performance. Yes. Efficiency is an essential indicator of athletic performance. However, all efficiencies must be in service of greater power production, not simply sought after without a good reason: efficiency has no real benefit when divorced from other variables. Here’s a quick but illustrative example: It takes a lot more energy to keep a spine straight, with hips, head, and shoulders evenly stacked, than it does to let that spine develop a pronounced thoracic kyphosis—the spine and shoulder curvature we associate with “bad posture.” Does this consume less energy? Yes. But in doing so, it puts a variety of systems—not just muscles, but even the respiratory system—at a disadvantage. (Tellingly enough, there’s an important relationship between metabolic and aerobic power and the capability to maintain an upright posture). If we try doing a front squat with bad posture, we’ll set ourselves up for either a plateau or an injury. In effect, we have to resolve this problem by increasing the body’s energy consumption (reducing efficiency) in order to produce the alignment that allows us to correctly perform this movement under load. Ultimately, however, efficiency is extremely important in sports such as running. This is known as running economy. Elite runners tend to have great running economy, meaning that they use less energy to cover a certain distance. There are a few ways that running economy can be improved: one is to increase aerobic power. Six times as much energy can be gotten from molecules of glucose that are burned aerobically rather than anaerobically. Another way is to increase neuromuscular synchronization and power. A knee that collapses in or hip that collapses up during the running stride is known as a “power leak,” meaning that muscles are misaligned and therefore pushing the body up, laterally, or rotationally instead of contributing to driving it forward. Yet another way to increase running economy is to become smaller. This includes having reduced fat percentage and increased muscle percentage, but it encompasses more than that: runners that are volumetrically smaller have a much easier time traveling distance than runners that are volumetrically larger. Why? If you’re taller, not only will your bones and muscles have to be thicker (in order to retain the same proportions), but then your organs, especially your heart and circulatory system, will be working that much more to pump blood from your toes to your brain. It doesn’t matter what aspect of running economy you’re talking about. Not only does the economical runner expend less total energy than the non-economical runner, but a greater percentage of total energy expenditure ends up going towards crossing the finish line rather than being lost in vertical, lateral, or torsional oscillation, power leaks, or greater metabolic upkeep. The question of efficiency or running economy should always be asked in tandem with the question of athletic performance: is seeking some initial efficiency—for example, bowing my upper back because I’m tired—going to hinder my athletic performance or development? Personally, I believe that “good form” for any athletic activity is “that form which allows us to express greater athletic power.” That’s how it’s defined across martial arts, baseball, the decathlon, and marbles. That should be how we define it in running too. When a forefoot strike results from all the correct physiological and gait factors, a greater proportion of the stance will be spent on the forefoot, meaning that a greater proportion of the stance phase will go into force production. The stance is shorter overall, and the speed is faster. Is this stride type more costly (and does it produce its own set of injuries)? Maybe, possibly. Sure. Do certain distances place such a burden on people’s endurance—even that of elite athletes—that they opt out of the “power producing” stride type completely? That’s the billion-dollar question, and given the answer, we might find that it is completely within reason to adopt a hybrid stride or even a heel strike at certain distances, full stop. (Or, you know, we could just walk). Great form (and great technique) are expenses of energy, both immediate and in terms of time and training. But achieving them will facilitate efficiency at a higher athletic level: we’ll expend more energy, but we’ll be able to apply a greater percentage of that energy towards the achievement of our athletic goals. Athletic performance is not about efficiency. It’s about power. One of the most oft-used pieces of artillery in the debate of minimalism versus maximalism, forefoot versus hindfoot, and barefoot versus shod, is the discussion of efficiency. Numerous studies have come out that rank the efficiency of these running types against each other, and consistently find that shod/hindfoot/maximalist tends to be more efficient. (For the record, I think that the first camp that made the efficiency claim was the barefooter/forefooter/minimalist one. For reasons discussed below, that was a bad call). It has, however, always been a function of increased power output. Before going into the science of it, let’s discuss how this makes sense from a logical perspective. Time has alwasy been the primary form of currency. A powerful runner can finish a race and begin recovery much more quickly than a slower runner. This frees the powerful runner from the effects of the race much more quickly, and reduces the time that it takes for this person to engage fully with a new task, relative to a less powerful runner traveling the same distance. The benefits of this are as obvious as they are many, whether we be talking evolutionarily, or in terms of the body’s economy. This also holds when you look at how we define performance across all sports: increased power (and not increased efficiency) begets greater performance. Whether it be during a running race or a baseball game, whoever can apply the most energy effectively in the shortest amount of time towards achieving the goal will come out on top. The science corroborates this theory. In Running Science, Owen Anderson is quite clear: “The marathon is a power race.” He discusses at length how the idea of doing long, slow training for what is (presumably) a long, slow race is superficially logical but ultimately flawed. 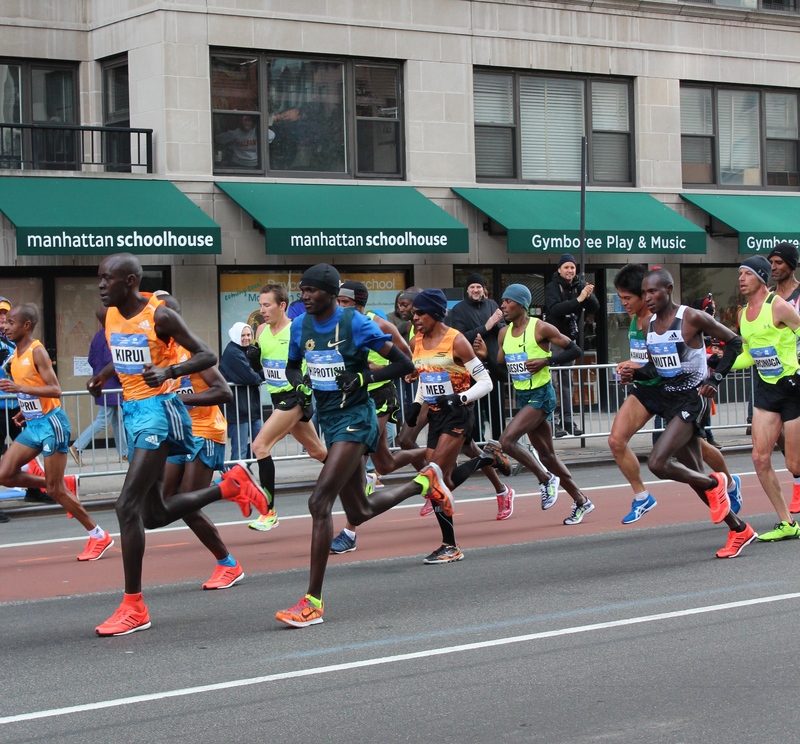 While developing aerobic capacity is immeasurably important for the marathon, as speeds get faster, greater power becomes more and more important. The importance of power holds even for the ultramarathon. Numerous studies have been done confirming the idea that phyisological indicators of power maximums—peak treadmill velocity and VO2 MAX—correlate strongly with ultramarathon performance. The sports technique (whether it be running technique, golf technique, swimming technique, etc.) that lends itself to the development of greater power, and not increased efficiency, can be judged to be “better,” given that what makes us universally better at sports is the application of greater power. As this article finds, more runners rise onto their forefoot the faster they go. Landing on the hindfoot is reserved for the slower crowd. But there may be other, more insidious problems with seeking efficiency in lieu of (or at the cost of) power. In my last article I wrote how, if increasing efficiency is our primary goal, at some point we are going to be sacrificing power—basically engineering our own performance losses. It’s fine with me that some people genuinely don’t want to seek greater performance, and rather run (or do other sports) for maintenance, rather than increase, of fitness. But this discussion of performance brings up a series of questions that I believe are legitimate: is heel-striking a “running style,” or is it a biomechanical feature—a hallmark—of subcompetitive fitness? Are heel-strikers slower, or does heel-striking make the runner slower (or alternately, become a barrier to improvement)? I believe that this discussion merits an extensive inquiry into why heel-striking is the form of choice across a majority of runners. Is this the case because more efficient is better? Or is it the case that a majority of runners are lacking in the aerobic, muscular, or metabolic power necessary to sustain a more costly technique—one which constitutes the gateway to greater athletic performance? These are not rhetorical questions, and they are certainly not answers. However, we treat the literature’s findings in regard to efficiency as if it somehow settles the footstrike debate (or lends evidence either way). It’s time to open the discussion again, and do so by asking questions that are more relevant than efficiency to the human body’s design, as they are to its athletic performance. Don’t confuse exercise with training! Outside Magazine just came out with an article that talks about the difference between exercise and training. The contention is that exercise is more of a social activity, while training focuses on the development of the body. The article cites an interview with Mark Rippetoe, the first coach to give up his National Strength and Conditioning Association credential. Rippetoe believes that one of the problems with the fitness industry is that they develop and market exercises to appeal to the consumer, not to develop the body—and worse yet, they either obscure this distinction intentionally, or are happy it remains in neglect. I am excited that Outside Magazine is grappling with these distinctions, and promoting knowledge for the lay athlete. Because these marketing and social forces shape and ultimately define our training, our athletic development is at their mercy. The key to dealing with them is knowledge: by “trusting” in an exercise or a diet, we are sure to be playing to someone’s marketing scheme. Ultimately, simplicity wins out—but it is impossible to market. There will never be an exercise better for developing aerobic power than endurance running. Since it is simplicity that makes it work, no amount of sophistication will do the trick. The same goes with strength: floor and barbell exercises are by and large all you need—and perhaps a simple weight such as a kettlebell. So the fitness industry has no choice but to fabricate a story as to why so much variety and so much complexity is so important. Buying into this media machine means that while we look for ever more obscure and esoteric exercises, the athletes that keep it simple will be faster and stronger—and the reasons for their speed and power will remain completely obscure to us: the media veil that the fitness industry succeeded in putting over our eyes filters those reasons out of our awareness. He said this for a reason. It’s up to each of us to explore why. The “center of gravity” is represented by the red dot. All this is completely true. But what does “center of gravity” mean, anyway? The “center of gravity” is the point in a body around which the resultant torque (or “resultant force“) due to gravity and other sources of mechanical energy vanishes. In other words, all of the forces that are generated by the body, as well as their interactions with the earth’s gravitational field, all get canceled out at the center of gravity. The resultant force. This isn’t a commonly used term, but it’s one whose implications we should understand if we want to become safe, effective runners. Some of us just want to run slowly. We don’t really want to get fast—we just don’t care. All models are wrong, and some are useful. That goes for any and all of our ideas, including our body’s idea of what is the best way to run. No idea will ever be able to exactly model the world. But some are more useful than others—and the useful ones are useful because they account for such realities with a certain success. We must stand in observation of the reality that, when we run, the most important force we will interact with is The Force of Gravity. The quality of our interactions with gravity will determine whether we become injured or not (among other things, like speed). In systems thinking terms, we move and live within a particular physical system. Inside of that system, there are certain constant and variable forces which the body must be capable of interacting with. If it isn’t (yet) capable of interacting with those forces, and we push it to do so, we will compromise its integrity. In that system, if we push off the ground, we will accelerate back to it at a rate of 9.78m/s² (32ft/s²). Which means two very important things: first, that the longer we are suspended in the air, the more we will accelerate. Second, in order to maintain bodily integrity, our muscles (but also our bones and connective tissue) must be strong enough to resist the stresses incurred by interacting with that magic number. What this amounts to in athletic terms is that body must have (1) very strong muscles, capable of responding explosively in sustained activity, and (2), the ability to maintain the center of mass (the torso) relatively stable throughout the run. In other words, it must have the ability to make the torso rise and fall as little as possible. How does the body achieve this mechanically? It also means that they are more capable of withstanding the stress placed on them by gravity. [That is] an almost infinitesimal change and therefore one that most runners can easily make. In the interest of beating this point into the ground (pun intended), that’s 12 minutes and 36 seconds we’re not accelerating towards the ground. And remember the thing about acceleration: the first 20 milliseconds and the last 20 are not created equal. If we’re running at 150 steps per minute, we might be in the air for 60% of the gait cycle. Doing the calculations for you, we’re accelerating towards the ground for 116 ms.
At the end of the first 20 ms of acceleration, we’d be going at a speed of .09 m/s second (.29 f/s). At the end of the 116 ms of acceleration, we’d be going at .056 m/s, or 1.64 f/s. But if we make a 20 ms improvement from 116 (in other words, 96), our maximum falling speed would be of 0.47 m/s, or 1.54 f/s. Let’s reiterate: A 20 ms improvement from 116 ms means that the runner is going a tenth of a foot per second slower upon hitting the ground, and it’s only that way because of muscles that are stronger. If take the time and energy to make our bodies more capable of interacting with gravity, we will inevitably end up being the faster version of ourselves. Being strong enough to interact with gravity is the minimum power requirement for a human runner. Although elite runners have muscles that are much more powerful than necessary to deal with the requisite 9.8 m/s², that number is where the laws of physics and the Earth’s mass have set the bar for human runners. That is our system. Those are its requirements. Let’s stand in observation of that fact. There are two good ways that I know of, that can get us to meet those requirements. The first is by jumping rope as I’ve described, and the second one is an exercise in this video by Dr. Mark Cucuzella (at 6:09). (By all means, look at the entire video—it’s very engaging and informative). Now, go talk to gravity until you’ve gotten to know it like an old friend. UPDATE: You can find a couple of good discussions on stride rate and running speed here and here.